Overall: The Amana A8RXNGMWS top freezer refrigerator was a great option for those who were limited on space, but still wanted their refrigerator to have a bit of style. The only way you'll be able to find it now would be used as it has been discontinued. Although we tested the stainless steel version we wanted to highlight the green tea finish because of it was a unique color and engraved floral look on the front right side. For those who want basic white and black, no worries, it came in both of them as well. Not since the 70's have the major refrigerator manufacturers even played with color! You get a lot for your money with just about any Amana Refrigerator, but the Amana A8RXNGMWS had a lot to offer above and beyond style. Update: This fantastic looking fridge has sadly been discontinued. :( You might be able to still find it somewhere online for sale but just remember discontinued fridges tend to have a shorter lifespan due to lack of repair parts. For the current models available, take a look at our favorite top freezer refrigerators from Amana. Full Width Spillsaver Shelves: Most Top Mount Refrigerators in this price-range come with those ugly, hard to handle, soon to rust, wire shelves. Blech! Not the Amana A8RXNGMWS!This model comes with Full Width, Glass Shelves that are spill-proof. Well, it won't keep you from spilling, but it will keep your messes a bit more contained when they happen. Either way, this is a feature usually reserved for much higher end models. Ice Maker: Ice Makers aren't very common in top freezer refrigerator models, so to have one included in this price range is a bonus worth considering. Most people who consider top mount fridges simply don't have the ROOM for a side by side or French door refrigerator. So, to have a fridge that fits the available space AND includes an ice maker. Oh happy day! Gallon Storage In Door: Having the ability to keep larger gallon containers out of your way really makes the interior space that much more versatile. And of course, you can always find the milk. Colors: The Amana A8RXNGMWS model we tested was Stainless Steel. Which was modern, sleek and hid fingerprints rather well.The black wrinkly look on the sides was not our favorite, but considering you won't see it very often, who cares, right? Unless it's not neatly tucked away into a little cubbyhole hole in your kitchen then it might be something to consider. Now let's talk about the real deal here: the Green Tea finish. It's a beautiful muted green with intricate leaves and flowers on the right half front of the fridge. This type of look is only something we see sold to the European markets. If you want a fridge that will truly add style to your kitchen and people will TALK ABOUT, consider this fridge! If the Green Tea or stainless really doesn't work for you, it also comes in Black and White. Funny enough the white version is able to be used like a dry erase board to write up your grocery list or to even leave messages for others. It's perfect for roommates, large families and children that are dying to write on something other than paper (or the walls!). Efficiency: Here's one of it's biggest downfalls, the Amana A8RXNGMWS is not Energy Star rated. :( But it's also not a huge refrigerator so it won't use much energy. MSRP: $849 is the MSRP for most of the colors of this particular model. Seeing as it has been discontinued, so you should be able to find it for much less. Before it was discontinued we were able to find it for at least 15-25% off. 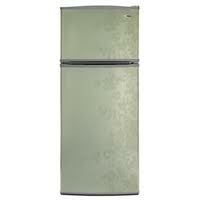 While there are few refrigerators on the market that come close to the styling of this one (Green Tea - hint, hint! ), there are other top freezer fridges still worth considering. We've included other models on our Amana top freezer list to compare to this one. Remember that this specific model was created to make you feel indulgent while most other top freezers are more "bare bones" for those just looking for basics. If you can no longer find the Amana A8RXNGMWS and the models above don't have enough flair for you, then you may want to consider one or two of the other current models from Amana as top mount fridges are what they really specialize in.